​and learn how to interact responsibly with stingrays. 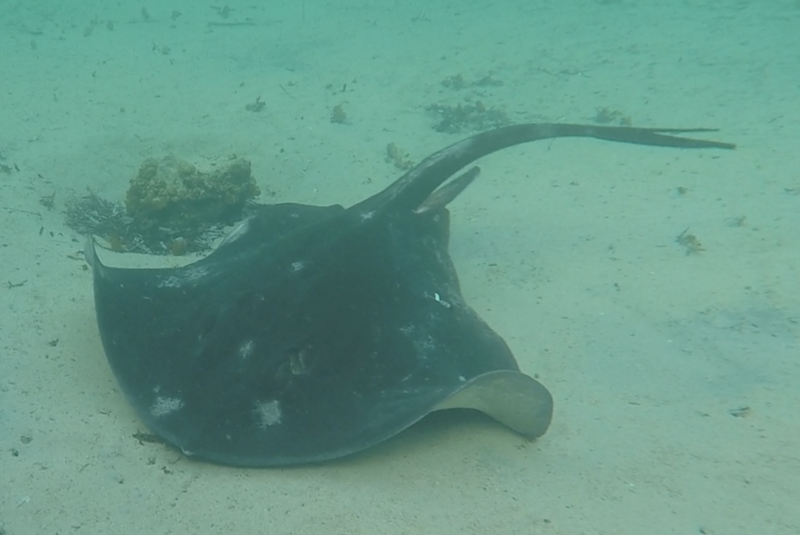 Also known as bulls rays, black rays or short-tail stingrays, smooth stingrays are the largest species of stingray in Australia and they are one of the largest species of stingray globally. They grow to a whopping 4 meters in length, almost 2.5 meters wide and can weigh up to 350 kg. They range from black to blackish-brown to greyish-silver and have white underbellies, which you can see in the picture below. They are often confused with the brown stingray (Bathytoshia lata), but differ in that they have a characteristic series of white 'freckles' that run from the front to the middle of their wings. These dots appear to be unique to each individual and can be used for identification, kind of like our fingerprints! ​Being a stingray, smooth stingrays can have up to 3 barbs (stings) protruding from about halfway down their tails. These barbs are backwards serrated and can cause serious injury or even death. The barbs are also coated in a toxin that causes immense pain. Despite this weaponry, smooth stingrays are renowned for being incredibly placid. Two smooth stingrays and a pelican. 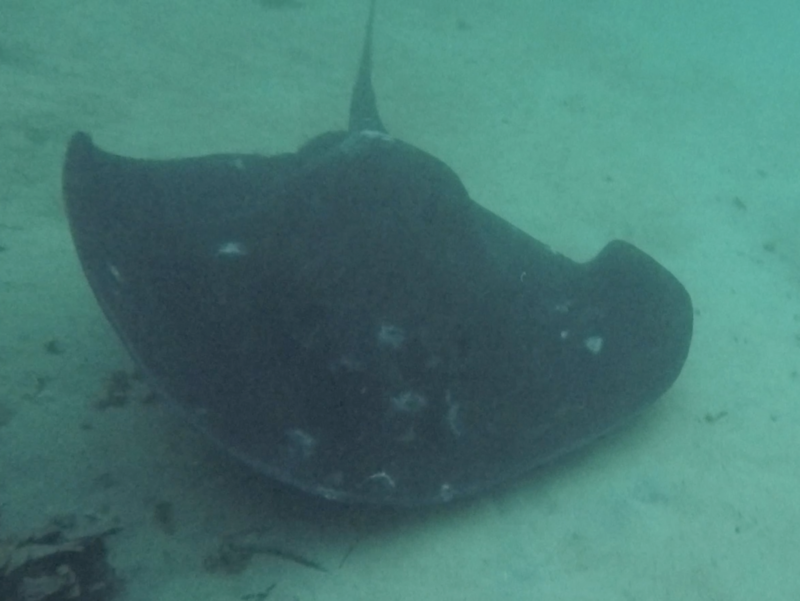 To date, almost 30 smooth stingrays have been tagged and tracked in Jervis Bay and Bendalong for The Stingray Diaries project, and tissue samples have been collected from even more. Meet some of our favourite rays below. Big Momma was the first ray to be tagged as part of the Stingray Diaries project back in 2016 and we have seen her every year since. Nomad was the second male we tagged for the project. About a month later he was detected some 200 km south. Quite surprising for a species thought to have a home range of about 25 km. Stumpy Lou is named so because she only have a stump where her tail used to be. She was one of the first rays tagged back in 2016 and we have seen her on every single trip since. Raylene is the original matriarch at one of our study sites. She is big and full of attitude, chasing off any other ray that tries to get her fish! Blue is the greediest ray we have encountered. 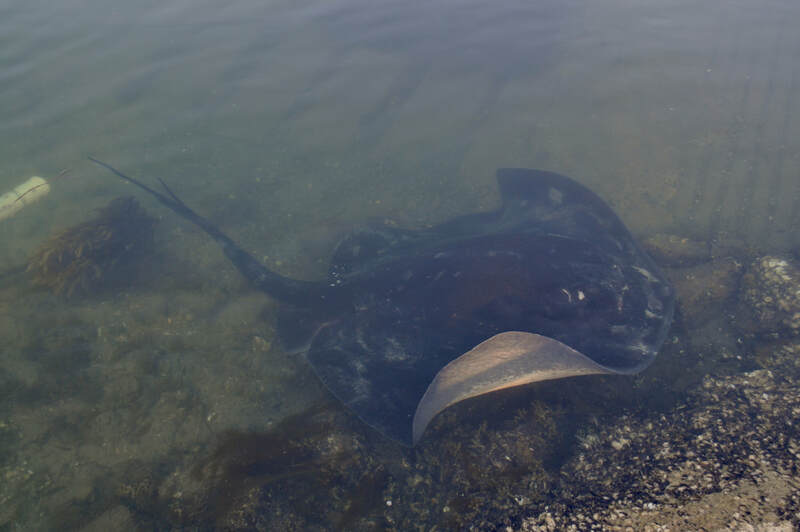 She will sit over our bait box while we try to chum other rays to be tagged, and she will actively push at your feet until she gets a piece of fish. Beastie girl is one for the record books. 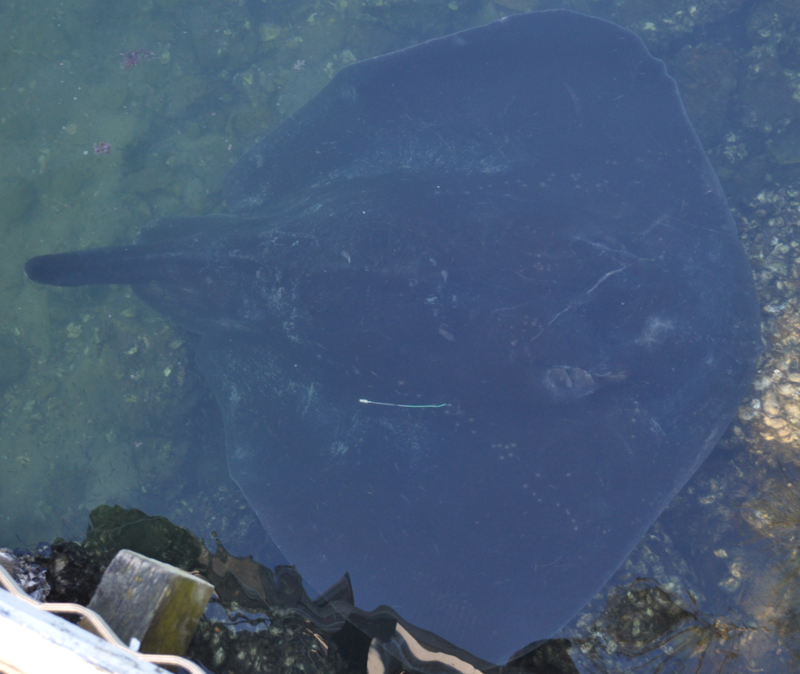 She is the biggest ray we have ever tagged, measuring in at a whopping 2.3 metres wide. Needless to say, she made Joni feel very small while trying to tag her. Enjoy the moment! 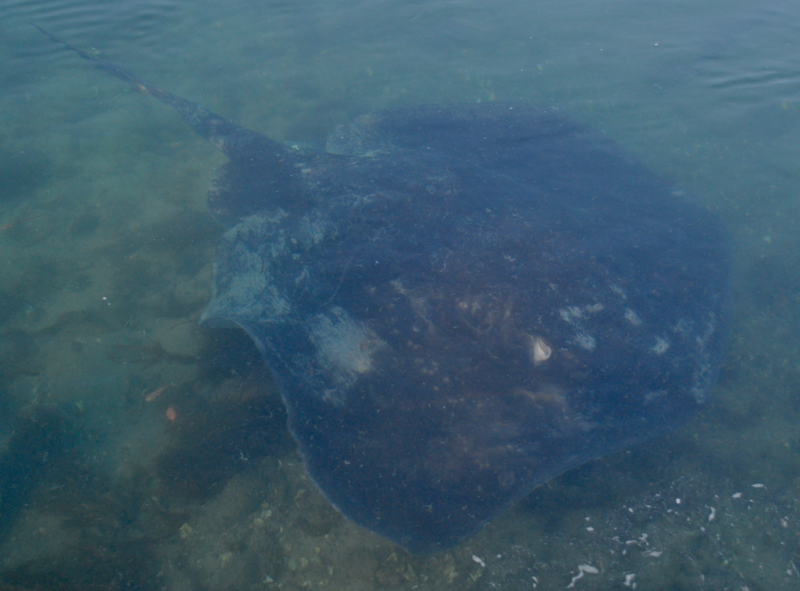 These rays are incredibly charismatic and curious. They are a real wonder to watch in the water. If you are in south-eastern Australia you can also report your sighting to help us find hotspots for these beautiful rays. Make sure you note down when and where you saw it, and it would be great if you could snap a photo or two. Stingrays are wild animals and with any wild animal it is important to act responsibly around them and treat them with respect. Despite being equipped with some gnarly weaponry, stingrays will only lash out if they feel threatened and cannot escape. Stingrays will often swim away before you get too close, but if you startle them or step on them, they will usually use their barb to defend themselves. Stingrays bury themselves in the sand while they are resting. This makes them very hard to see, so when entering the water make sure you do the stingray shuffle. By shuffling your feet through the sand, the stingrays can usually hear and feel you coming and swim away. Also, because you aren't lifting your feet, you won't be able to step on them. 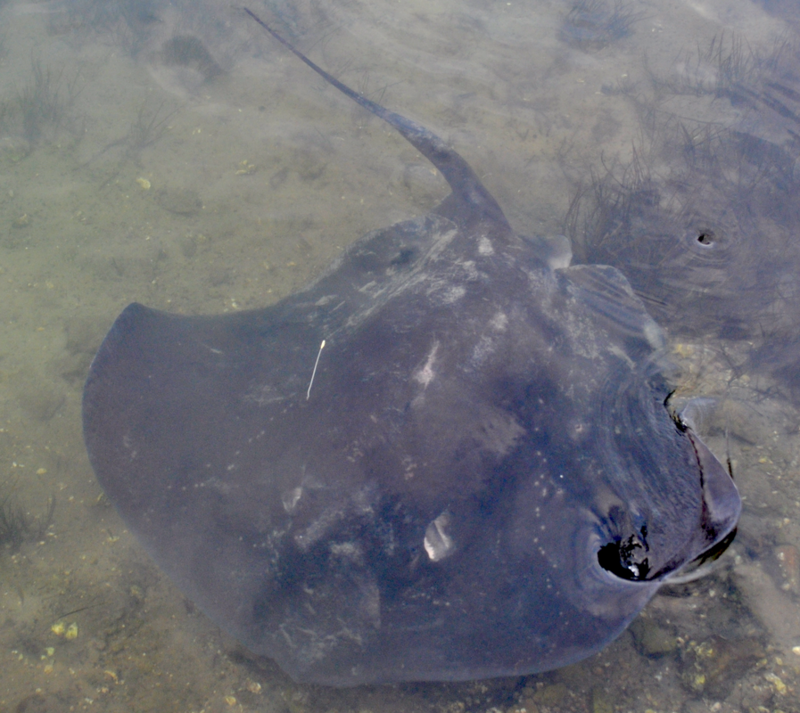 If you encounter a stingray whilst swimming, never approach it or try to touch it. Never swim up behind them or over the top of them. This is where a predator would approach from and if you startle them they can easily get you with their barb. In the rare event that you are stung by a stingray, it is important to know what to do. Immediately rinse or immerse the area in the hottest water you can handle. This denatures the toxin and helps with the pain. If the barb breaks off in your skin, do not remove it. The barbs are backwards serrated so it will do much more damage being pulled out than they did going in. Call emergency services or go to the emergency room. Often, pieces of barb or tissue break off in the wound and need to be cleaned out. If the bard is still in your skin, medical staff can remove it for you.